Spa comes from the Latin word “solus per aqua” which means health through water. Spa is dedicated to provide therapies and services in an atmosphere that facilitate the healing forces of nature. Whether it's the healing water from the springs, energy from the crystals found in the mountains behind, or the beautiful crystal water fountain, these hidden forces of nature combined with the skilled therapists help to rejuvenate and restore your body's equilibrium. Upon arrival at Cochin, meet and greet at the airport by our representative who will get transfer to the hotel for check-in. Today morning after breakfast start your city tour with Mattancherry Palace also known as the Dutch Palace, check out the interiors of the palace that are decorated with the mural's from Ramayana and there are some lively displays of royal costumes and palanquins. Then proceed to the St. Francis Church built by the Portuguese in 1510 AD and is believed to be the oldest church built by the Europeans in India. Later visit Bolghatty Palace and Jewish Synagogue. In the evening, you will enjoy Kathakali dance show. Overnight at the hotel. After breakfast lave for sightseeing tour of Munnar. Munnar is a beautiful hill station and is worth visiting, not just for unwinding and complete relaxation, but also for the various tourist attractions in Munnar. Anaimudi Peak - While in Munnar, visit the Anaimudi Peak, which is considered to be the highest peak in southern India. One can set up tents for camping and trekking at an altitude of about 2700 meters and enjoy the tranquil mountain atmosphere. It is a feast for nature lovers and enthusiasts. This peak provides the ultimate high and holiday experience. After breakfast leave for Periyar (03 hrs), arrive & check in to the hotel. Later visit the Periyar national Park. Watching the rare and endangered species of the animals such as Asian elephants, barking deer, gaur, sambar, wild dogs and strolling in their herds, provides you the most enchanting experience of the lifetime. Apart from exploring the different species of plants and animals you can also enjoy wildlife photography. Overnight stay at the hotel. 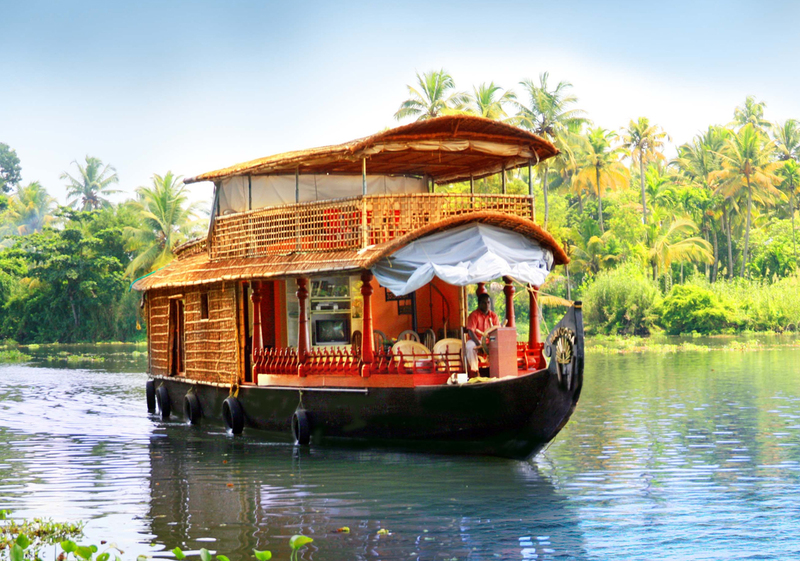 Morning start heading towards Alleppey to board on the beautifully decorated houseboat to Alleppey. After breakfast leave for Kovalam (05 hrs drive approx), located in south of Trivandrum. There are two main beaches at Kovalam, separated by a high cliff. It is finding a new significance in the light of several Ayurvedic salons, recuperation & regeneration resorts which provide a slew of Ayurveda. Upon arrival in Kovalam check-in to the hotel. Day free for Ayurvedic therapies. The treatment offered here gives pleasure to one's body soul, body and mind. Today morning after breakfast drive (20 minutes drive approx) to Trivandrum, an ancient city with trading traditions dating back to 1000 BC.